Speak and your words appear on the screen! Control your computer by voice! Speech recognition software has been an integral part of my day-to-day life, productivity, independence and sense of self-worth ever since an accident left me quadriplegic with significantly impaired upper extremity function almost six years ago. This software has been around for many years but still has not fully “caught on” with the general public. 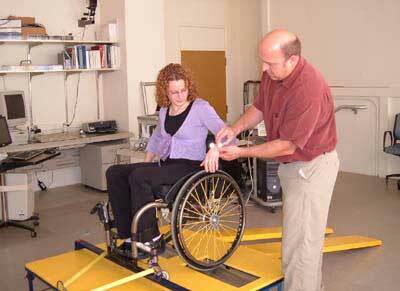 As a tool for the disabled community, however, it can be invaluable. 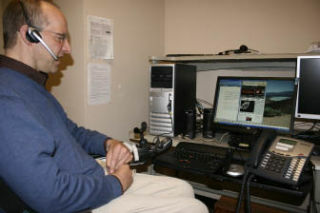 Speech recognition programs allow you to speak your thoughts and have your words immediately transcribed onto the computer screen. But they are much more than simple dictation programs. You can perform all computer operations using your voice instead of the keyboard or mouse. You don’t need special hardware; any current computer, desktop or laptop, can run speech recognition. The manufacturer recommends 1 GB RAM (2 GB for Windows 7 32-bit and 4 GB. For 64-bit) and 2.4 GHz (1.6 GHz dual core) processor speed. The program even comes with its own headset microphone, but for best performance you’ll probably want to upgrade. There are a few speech recognition software programs on the market, but Dragon NaturallySpeaking is the most functional and the one that I use. Dragon is an exceptionally useful tool for individuals who have impaired hand function or anyone who finds composing text via keyboard to be difficult, tiring, painful, or inefficient. It can also help individuals with certain learning disabilities, such as dyslexia or dysgraphia, or those wanting to increase their productivity, since most people can speak three times faster than they can type. Work easily throughout the Windows operating system and Microsoft Office suite. Create, format, and print documents in Microsoft Word. Use Outlook to send e-mails and maintain a calendar and contact list. Configure computer and program settings. Perform PC maintenance and troubleshoot problems. Set up, configure, and maintain a home wireless network. Take care of all your financial management tasks, including downloading credit card and banking transactions from the Internet, paying bills and maintaining budgets. Shop online and purchase gifts and all variety of essentials. Use the Internet for research, e-mails, and social media interaction. Use Internet mapping programs such as Google Maps, Google Earth, MapQuest, etc. In short, with Dragon, practically anything that is typically done by physical manipulation of a mouse and keyboard can be done instead by voice. Hands-free computing means just that, the only physical task required is pressing the power button. After that, all computer operation is accomplished by voice, even turning off the computer at the end of the day. And what’s more, you can switch between using Dragon, the keyboard, and the mouse at any time. As an experienced user, I am able to do things using Dragon more quickly than someone physically manipulating a keyboard and mouse. Just like many computer utilities, there is a learning curve, and you’ll probably get up to speed faster if you are already a competent computer user. But I am so satisfied with the program that I enthusiastically advocate its use to anyone who can benefit from it, including the computer novice. 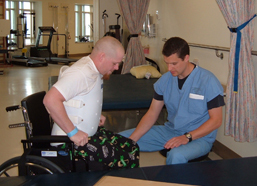 On Thanksgiving weekend, 2004, as an avid off-road motorcycle racer, I crashed during a race and sustained a spinal cord injury resulting in incomplete C4 level quadriplegia. My introduction to Dragon NaturallySpeaking began while I was still on the rehabilitation wing of Harborview Medical Center in Seattle. As soon as I was into a wheelchair and able to access the computer lab, the speech pathologist began teaching me Dragon. Almost immediately I was back in communication with fellow off-road motorcycle enthusiasts via the online forums I frequented before my accident. It was a wonderful feeling to be reconnected, have that sense of community and thank everyone for their amazing support. Today I work at the Northshore Health & Wellness Center in Bothell, Washington, where I train others in Dragon NaturallySpeaking speech recognition. We provide introductory and advanced classes and can train you at the Center, at your location, or even via a remote computer connection. Perhaps you’ve heard about speech recognition technology but have been doubtful about its value or ease of use. To show you firsthand how user-friendly speech recognition has become, Northshore Health & Wellness Center is offering demonstrations of the program either at the center or your location. Dragon 10.1 is the current version and it comes in three different editions: Standard, Preferred and Professional. Standard retails for $100 but can be found for as little as $32; Preferred retails for $200 but can be found for $130-$150; and Professional for $900. The Washington State Division of Vocational Rehabilitation provided me with the Professional Edition as part of my employment plan. 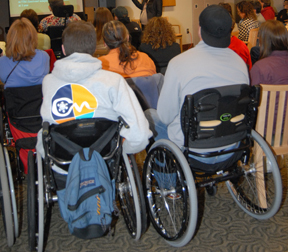 Other resources include the Washington Assistive Technology Act Program (WATAP) at 800-214-8731 and the Washington Access Fund (WATF) at 877-428-5116. A lower cost alternative is Windows Speech Recognition, included as part of the Windows Vista and Windows 7 operating systems. Although not quite as powerful as Dragon, Windows Speech Recognition can also allow you to do almost hands-free computing. For Macintosh users there is Macspeech Dictate, which will hopefully soon equal the performance of Dragon as it was recently purchased by Nuance, the manufacturers of Dragon. If you have more questions or are interested in trying out Dragon or any of the other speech recognition programs, please contact me or Gary Ancelet at the Northshore Health & Wellness Center, 425-286-103, or e-mail me at joektm520@msn.com.